Putting My Family on the Glycemic Index Diet… And Living to Tell About It. T he first hiccup would occur in mid afternoon when I would become overwhelmed with a kind of fatigue that no amount of coffee or diet soda could overcome. When my fog finally cleared and it was time to make dinner, another snag appeared – my kids turned into tattling, slapping, hair-pulling, screaming and crying monsters. Many evenings I would dive headlong into a glass of wine while the meth amphetamine-driven romper-room ensued. After dinner, all was calm on the suburban front until the evening news when my husband would help himself to a huge midnight snack that rivaled dinner. These nightly meals disturbed his sleep, digestion, and at times his disposition. Relief came the day I learned about the Glycemic Index (GI) Diet from my fitness trainer. At first glance, it seemed to benefit diabetics more than typical folks like us. Yet, as I studied the diet more, I realized it was the key to a bliss-filled home. Simply, the Glycemic Index (GI) is a ranking of carbohydrates on a scale from 0 to 100 based on the extent to which they raise blood sugar levels after eating. High GI foods break down quickly during digestion, causing blood glucose levels to increase quickly, and then drop suddenly. Examples include most breakfast cereals, white bread, short-grain rice, potatoes and most crackers. Low GI foods consist of carbohydrates that slowly break down during digestion, gradually unleashing glucose in the bloodstream. Examples are whole-grain breads, most fresh fruits and vegetables. Ate plenty of salad vegetables with a vinaigrette dressing. Some other tips and tricks I followed were: Mixing – When you combine high-GI foods with low-GI foods in one sitting the final GI value will be medium. Therefore, it’s acceptable to combine rice and lentils or even apple slices with potato chips. Al Dente – When foods are cooked for a long time, their structures change causing the particles to swell into soft, gelatinized blobs that are easy to digest. The faster a food is digested the higher the GI-value will be which is why al dente pasta has a lower GI than the overcooked variety. Acids – Acidic foods reduces the rate at which food is broken down and lowering its GI value. Vinegar, lemon juice, lime juice citrus fruits, and sour dough bread are great examples of acidic low-GI foods. Fibers – Such fibers as oats, beans and apples slows digestions and lowers foods GI levels. On the home-front, I first replaced all potato chips and other processed starches with peanut butter on apple slices, orange slices and small chunks of cheese for my kids’ after school snacks. Within a few weeks, I noticed that the early evening fights and tantrums had decreased to a few manageable squabbles as their blood sugar levels remained relatively. In addition, complex carbohydrates found in many low-GI foods boost levels of serotonin, a neurotransmitter that produces calm and happy feelings. 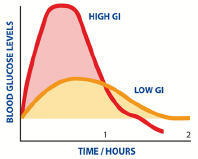 High-GI foods create quick mood boosts followed by quick crashes that leaves you sad and agitated. According to recent studies, low GI diets benefit kids in other areas as well. Research at Massachusetts Institute of Technology found that children raised on diets high in refined sugars had lower-IQs than those raised on low-GI diets. I quit my early morning bagel habit for a whole-wheat English muffin. By lunch time, I wasn’t so ravenous for high-GI carbs like French fries and white pasta. Soon after, my mid afternoon fatigue disappeared. High-GI foods I was eating caused sudden peaks and valleys in my blood sugar making me crash. With this new eating plan, my gradual insulin rises give me more even amounts of energy. As an added benefit, I even lost a few pounds since low-GI foods keep you satiated more and hungry less. Gradually I started making low GI dinners using salads, whole-wheat pasta, and lean meat, fish, and chicken. For wonderful low-GI recipes, visit Glycemic Index and read about the South Beach Diet Phase 1 plan too. As a result, my husband is no longer ravenous and his late-night forages into the refrigerator have markedly decreased. Low GI foods benefit every member of a family. They enable you to feel satiated longer so you can maintain a healthy weight, and provide your body and brain with more consistent energy throughout the day. 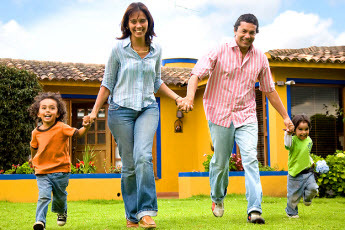 They can also help prevent major health problems endemic to the United States. Suburban bliss has never felt so good. I agree, having battled for years to try and stay slim and fit, and like many others wasting so much time, energy, and money on faddy diets I eventually came across the glycemic index. I have adhered to the glycemic way of dieting and it really does work! As an added bonus this kind of healthy eating staves off Diabetes, a condition common in my family, so with a bit of luck, two birds with one stone as they say.